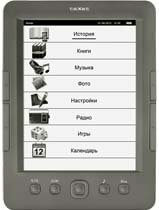 E-ink-Reader. Similar models of e-book readers. Quite often among industrial products, to which the garments, shoes, etc., you can see the same model, but under different brand names. Probably everyone knows what country come to our market such a product? As it turned out, this feature of modern production touched the e-book readers. There is a group of devices for reading, which appear identical (except for the brand, and perhaps body color) of each other no different. They are assembled under one scheme, according to some figures. The difference can be hidden in software only. Firmware for these readers may be different, but fully interchangeable. The known devices Lbook , it turns out, have a minimum of three "twins." These models are not available in Russia, Ukraine and Belarus. Their dwelling place - China and some European countries. Firmware of these devices are fully compatible with each other. Thus, you can buy in Europe or China, say Hanlin Ereader V5 and changing firmware him get Lbook V5 with Chinese characters on the body instead of the hedgehog logo. Another group of devices is slightly different in appearance, but the original electrical drawings to make them seem to have been taken from the same source. Readers have finished a little further and provided each of them their software. Firmware in these devices is partially or completely interchangeable. Look at the pictures of e-book readers Airbook EYT601, Wexler Book E6003, Assistant AE-601, Ritmix RBK-600, Prology Latitude I-601, Texet TB-146 - all models under the screen are two buttons on the left, center and right of the joystick are two keys at TEXET still has keys perelistyvainya sides. It seems that the "filling" under all those hulls is practically the same. Our colleagues from the forum 4pda.ru found ability to install any firmware within this group of devices. But after installing the software from the other models, along with the acquisition of useful functions for e-book reader may (but not necessarily!) not running to certain keys, radio and other functions. The following models - absolutely new devices with the function of LED illumination e-ink screen. This DIGMA R40G, Gmini MagicBook C6LHD and DNS Airbook EB602 6. As you can see in the photo - in case readers are different, and all keys are on the same ground. According to the users of these devices, the firmware they are also interchangeable. The more knowledge about similar models, readers of different companies can be helpful? Each developer of software (firmware) provides the reader with its own set of supported features a variety of programs for reading text, various bookshelves, etc. If you do not like the lack of certain features in the e-reader, you can try at your own risk reflash device software from the "twins".